Restore is defined as ‘to bring back’, ‘reinstate’ and or ‘re-establish’. Restorative Yoga helps to re-establish homeostasis or equilibrium both at a physiological and mental level. Restorative Yoga is a body of practices that bring us back in touch with our inherent ability to be in balance with ourselves (physical, mental, emotional and spiritual) in line with the environment. This balance is partially achieved by activating the relaxation response – learning to consciously ‘switch on’ the ‘relax and recharge’ system i.e. the parasympathetic nervous system, is an invaluable tool in a culture that seems to promote and reward ‘doing’ and productivity as the way to live. The ancient yogis acknowledged this as they knew the secrets to longevity and preserving vital life force from times immemorial. 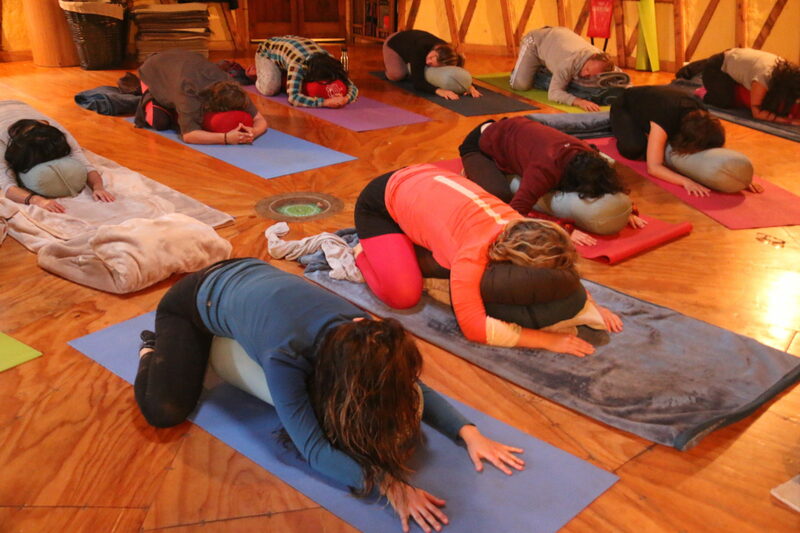 In modern times, Restorative Yoga allows us time, space and breath to reconnect with our inherent life force. In more dynamic yoga we may be so busy with our ‘Practice’ that we may forget to give ourselves the time and space to notice the deeper levels of the practices themselves. Without the distraction and constant physical pre-occupation we have time to slow down and become fully present with what we are doing. Below, we’ve listed exactly how Restorative Yoga can help to heal you. As you practice, the breath rate lowers and the parasympathetic nervous system is activated creating the relaxation response. This leads to improved oxygen and carbon-dioxide exchange, which improves immune functioning and overall health. The practice also tells any chronic tension patterns to let go, both physically and mentally. Deep stillness in the practice restores the body’s natural ability to rewire itself from old habitual reactions and accumulated tension back to a natural state of peace and harmony. Restorative Yoga encourages the release of neurotransmitters, i.e. Gamma-Aminobutyric acid (GABA), in the brain to improve your mood and lower levels of anxiety. Practice also regulates stress hormones, adrenaline and cortisol. This leads to improved adrenal functioning which helps the body control blood sugar, burn protein and fat, react to stressors like a major illness or injury and regulate blood pressure. This in turn leads to more healthy level of bodily functioning as well as maintaining balanced energy levels. As the blood pressure is lowered, this reduces stress on the heart and organs allowing physical and mental flexibility to increase a sense of spaciousness and openness to meet life’s challenges. Restorative Yoga also stimulates the immune system, vital organs and the relaxation response, which enhances the immune function. This induced homeostasis allows the body to heal at a cellular level. Regularity with this practice allows mental and emotional tensions to be reduced, creating an overall feeling of peace and well-being. With the daily stressors of life, the mind creates neuromuscular knots in the body, accumulating in the form of energy blockages in the body’s energy pathways known as nadis or your meridians. Restorative yoga practices release these blockages increasing the flow of vital energy or prana. As the mind becomes still, the usual tendency for clinging unnecessarily to future-focused thinking and activity reduces. With stillness of the mind and body, a more subtle awareness of the body-mind and prana relationship is developed. Prana is intimately connected to the mind. The free flow prana brought about by asanas, results in the mental equilibrium and calmness. All of the above ultimately enables and cultivates the mind-body connection in order for you to deepen your relationship with yourself, giving further insight into your truer and fuller nature.